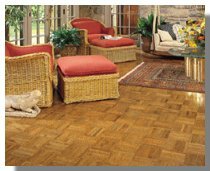 Hartco Parquet is available in 12" x 12" blocks with thicknesses of 5/16" and 7/16" solid hardwood flooring. Hartco Parquet hardwood floors are available in Oak with an exclusive, easy care HartGuard No-Wax Semi-Gloss Finish. These floors carry a Lifetime Structural Warranty, and are designed for residential use only. These floors can be glued down over wood or concrete subfloors on and above ground level. 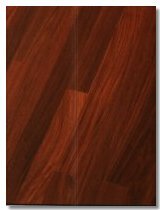 Hartco Urethane Parquet is a 7/16" thick x 12", prefinished, solid brazilian cherry hardwood floor. These floors have a square edge profile and feature the exclusive, easy care HartGuard No-Wax Urethane with a Lifetime Structural, 10-year low gloss Finish Warranty in Contractor/Builder Grade. Urethane Parquet can be glued down to wood or concrete subfloors that are on, or above ground level. The 1/8" foam back acts as a moisture barrier, provides insulation, deadens sound and adds softness for comfort underfoot. Urethane Parquet is a 7/16" thick x 12", prefinished, solid oak hardwood floor. These floors have a square edge profile and feature the exclusive, easy care HartGuard No-Wax Urethane with a Lifetime Structural, 10-year Finish Warranty in Contractor/Builder Grade. Urethane Parquet can be glued down to wood or concrete subfloors that are on, or above ground level. The 1/8" foam back acts as a moisture barrier, provides insulation, deadens sound and adds softness for comfort underfoot. Urethane Parquet is a 5/16" thick x 12", prefinished, solid oak hardwood floor. These floors have a square edge profile and feature the exclusive, easy care HartGuard No-Wax Urethane with a Lifetime Structural, 10-year Finish Warranty in Contractor/Builder Grade. Urethane Parquet can be glued down to wood or concrete subfloors that are on, or above ground level.